I just wanted to swing on by here and tell y’all that I’ve officially signed contract addendums on the remaining installments in The Other Place Series. First will come a novella from Arty’s point of view entitled Love and War (yes, I know it’s a similar title to Love or Money, but it just fits so well.) The last part of the saga is a full-length novel from Justin’s point of view entitled Synchronicity. I don’t have release dates yet, but I’ll let you know. 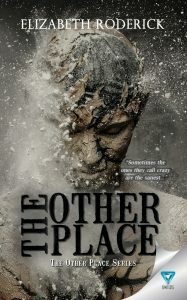 The second book in the series, entitled The Other Place, comes out on July 5, in just a few days! This is a book from the point of view of Justin, the Kid in the Park in The Hustle. Justin is schizophrenic, so you might think this book would be darker than The Hustle, but actually it’s not. Not even close, really. Justin has his struggles, but he lives a beautiful life. The Other Place is a book for all ages, whereas The Hustle is for the 18+ crowd. You don’t have to have read The Hustle in order to read The Other Place, but it does add depth to the story. You can read them in reverse order, as well. I really hope you read and love these books. I put a lot into them. Previous PostInvisible Friend Jesus vs. The UniverseNext Post The Other Place is Available for Preorder!